Last week marked The Armory Show’s annual takeover of New York City, bringing galleries and artists from all over the globe to Piers 92 and 94 on the banks of the Hudson River from March 3 to 6. Packed with exhibitors, artworks, and art enthusiasts, The Amory Show offered extensive visual offerings, alongside special projects and programming. CAA staff visited The Armory, taking in many of the noteworthy displays and activities on site. An interactive installation hosted by Artsy stood at the entrance to The Armory. The booth was covered by the artist Douglas Coupland’s Slogans for the 21st Century, which also adorned tote bags distributed to visitors. Statements such as “I miss my pre-internet brain,” “You and your selfie are merging,” and “I can feel the money leaving my body” offered wry commentary on the intersection of art, commerce, and technology at a site where these issues merged in a particularly potent way. Also at the Artsy booth was Deep Face: Comunicate with your future self, a photo booth that created “de-recognition” portraits of visitors. The photo—emailed to participants in a four-frame GIF format—features a black-and-white portrait overlaid with multicolored shapes. Coupland’s deliberate marking of faces aims to disrupt increasingly common facial recognition technologies, which add another layer of complexity to our relationship to the digital age. Technology and art also merged in many of the artworks on display. The artist Shih Chieh Huang transformed the Ronald Feldman Fine Arts booth into a psychedelic under-the-seascape. In the darkened booth, an electronic jellyfish-like creature moved its tentacles and flashed its light in rhythmic patterns. Made from plastic bags, plastic bottles, highlighters, and other everyday objects, Disphotic Zone merges the artist’s studies of bioluminescent creatures with childhood memories and an interest in the mutability of perception. More traditional artistic methods of painting and sculpture were also on view at The Armory. 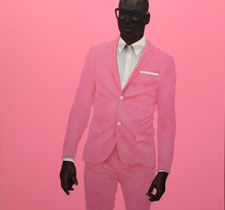 Especially dazzling was Barkley L. Hendricks’ Photo Bloke (2016) on display at the Jack Shainman Gallery booth, a large-scale oil and acrylic painting of a man in an electric pink suit and white sneakers standing before a similarly pink background. 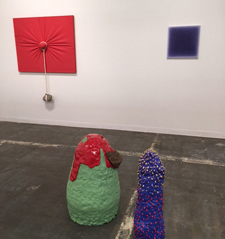 Adam Henry’s minimal, rainbow-hued canvases at the Brussels–based Meessen de Clercq’s booth were a delight to witness. 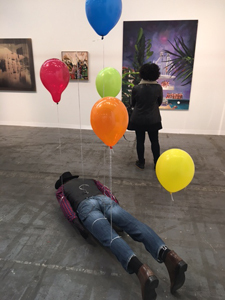 Other highlights included Sislej Xhafa’s sculpture Wyatt and Sky (2016), a life-sized mannequin in a cowboy hat lying face-down on the floor of Blain Southern’s booth with balloons tied tightly around his arms, legs, and torso, and the well-curated installation of works by Lygia Clark, Irma Blank, and Nobuo Sekie at Alison Jacques Gallery. Kapwani Kiwanga’s sculptures made out of steel and sisal fibers were intriguingly tactile. This year’s fair also featured a focus on design, tasking designers to create site-specific works that were on displays in Piers 92 and 94. 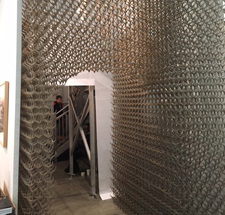 Sung Jang’s MOBI (2015), installed in the entrances to the stairwells connecting the two piers, completely transformed the usually mundane experience of moving between the two areas. In 20 Steps (2015–6) by Studio Drift, a moving installation made from glass tubes, wire, and steel hung suspended over a large lounge area like a breathing exoskeleton. Beyond the art viewing and booth hopping, The Armory also plans forums, panels, and conversations for its annual visitors. This year’s events included a section dedicated to Focus: African Perspectives—Spotlighting Artistic Practices of Global Contemporaries. Curated by Julia Grosse and Yvette Mutumba, Focus: African Perspectives included galleries from Africa, the work of African and African Diaspora artists, and a two-day symposium that brought together artists, gallerists, curators, and scholars for conversations. Panelists included El Anatsui, Kapwani Kiwanga, Kimberli Gant, Patrick Mudekereza, and others. Alongside Focus: African Perspectives was Open Forum, a series of talks on modern and contemporary art, featuring curators, gallerists, artists, writers, and more. The range of topics covered by these panels included Andy Warhol, the role of design in contemporary art, and the future of art. Especially lively was a conversation between Jerry Saltz, the senior art critic at New York Magazine and a prolific social media user, and Benjamin Genocchio, the executive director of The Armory Show. In “Like, Swipe and Double Tap: Visual Criticism in the Digital Age,” Saltz and Genocchio discussed the power of social media and the ways in which it has changed the evolving field of art criticism as well as the art world at large. Saltz took care to underscore the importance of owning your own critical language, especially in an era when the traditional system of criticism has been disrupted.